Holiday Wreath Deluxe 30″ Handmade in Montana USA. Give yourself, friends, relatives, employees, customers, and clients a one of a kind gift: their very own piece of Montana. Long lasting alpine fir Christmas wreaths from Holiday Wreath Company are exquisitely handcrafted of fresh cut alpine fir. These beautiful holiday decorations fill the air with the clean, sweet fragrance of the Montana mountainside. Each wreath comes decorated with ponderosa pine cones, little red berries and topped with a festive red velvet ribbon. 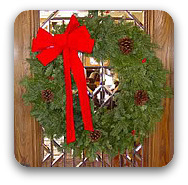 Its time to Create your own Christmas Tradition with Holiday Wreath Company. Order your alpine fir wreaths for home, office, or gift-giving online right now with our easy, secure online shopping cart. Then sit back and relax, we’ll hand-craft, pack and ship your piece of Montana to arrive fresh and fragrant, via UPS or priority mail. Thank You for last years wonderful Christmas Season! 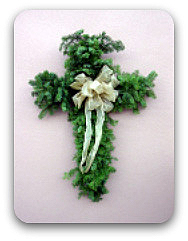 Our Most Loved Wreath Cross Keeping Christ in Christmas. All our wreaths are one of a kind handcrafted by long time Christian ladies with Love for the Jesus and compassion for all who receive our wreaths.